There are eight planets in our Solar System (sorry Pluto), but collectively, these planets host over 175 moons, one or two of which may even harbour life. Indeed, our galaxy, based on what we observe here, could be bursting with exomoons, a significant number of which may be capable of fostering life, according to new a new study. Using data gathered by the Kepler Space Telescope, researchers from the University of California, Riverside and the University of Southern Queensland have identified 121 giant exoplanets that might host habitable exomoons. No actual exomoons were identified in this study, but there’s a good chance these exoplanets, all of which have a radius three times wider than Earth, feature natural satellites. And because these 121 planets reside within their star system’s habitable zone, some of these exomoons might even have the conditions required for life. The authors of the new study, led by Robert Wittenmyer, say their work should inspire other astronomers to develop new ways of detecting biosignatures and other signs of life in the atmospheres of distant moons. This work now appears in the Astrophysical Journal. To date, NASA’s Kepler Space Telescope has been used to detect thousands of exoplanets, a small handful of which are rocky, Earth-like planets parked within their star system’s habitable zone—that special region where planets can host liquid water at the surface. The presence of persistent liquid water is important because it’s considered a critical prerequisite of life. A primary goal of the Kepler mission is to figure out the rate at which rocky planets reside within the habitable zones of their host stars. But as the new research points out, Kepler can also tell us the rate at which giant planets appear within those zones. 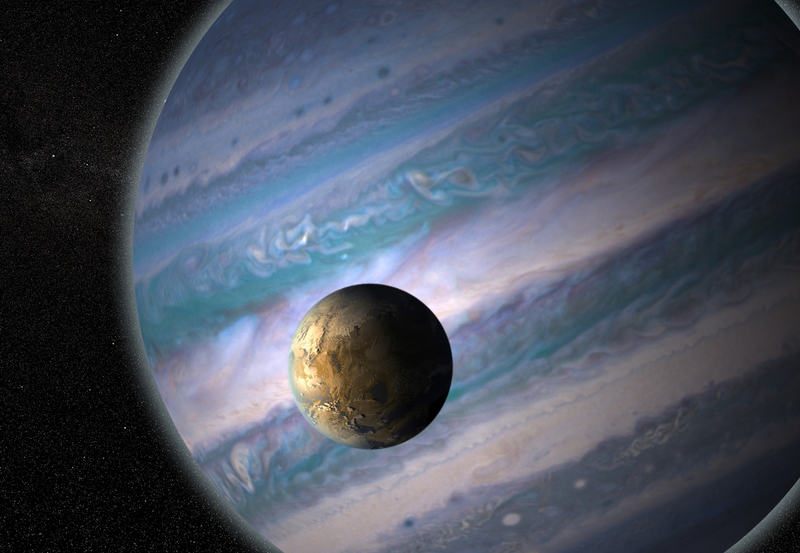 Artist’s depiction of a habitable exomoon orbiting a giant exoplanet in a hypothetical star system. Using Kepler data, the researchers estimated the frequency of giant planets (i.e. planets with a radius three times larger than Earth) in habitable zones. Their numbers show that about six to 12 percent of stars feature giant planets within their habitable zones. Working with the assumption that each of these exoplanets has at least one moon, they estimate that around 121 giant planets detected by the mission could host a potentially habitable moon. And that’s being conservative—the actual number is likely much higher. When we look up at our own Moon, we see a completely lifeless, sterile orb. But the situation could be markedly different for some exomoons, particularly if they’re in orbit around gas giants similar to Jupiter or Saturn. They represent intriguing candidates for life, but unlike Earthlings’ reliance on solar energy, habitants of these exomoons could use the radiation pouring out from their host planets. And in fact, exomoons may even provide a better environment to sustain life than Earth. On the other hand, Abel Méndez, a planetary astrobiologist and NASA MIRS Fellow at the University of Puerto Rico at Arecibo who wasn’t involved with the new study, says we should be cautious about ascribing habitability to distant moons. Méndez considers all these factors in his Habitable Exoplanets Catalog hosted at the Planetary Habitability Laboratory. His team estimates that, so far, among all confirmed exoplanets — not just those spotted by Kepler — there are only 40 giant planets in the habitable zone that are large enough to likely hold a Mars-sized or larger moon that could be potentially habitable. Still, it shows that exomoons are ripe for further investigation.